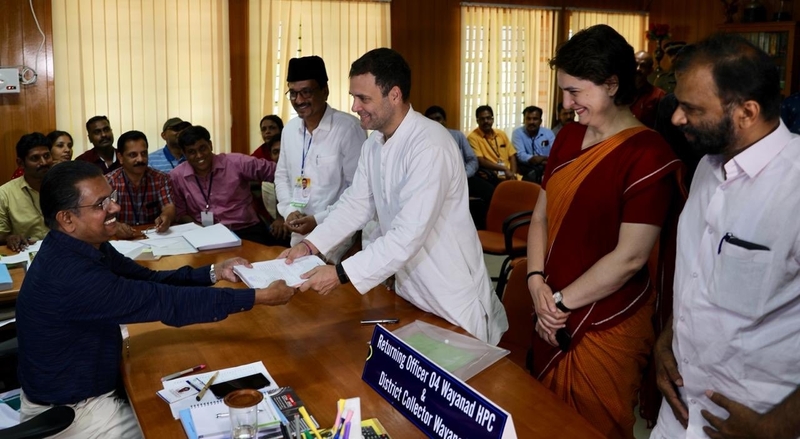 Congress President Rahul Gandhi filed his nomination papers from Kerala's Wayanad He landed there by a helicopter this morning, along with his sister Priyanka Gandhi Vadra, and headed to the district collectorate office in Kalpetta. After completed nomination procedure he held a roadshow there along with sister Priyanka Gandhi Vadra and other party leaders. A massive crowd of Congress workers and supporters carrying party flags greeted the brother-sister duo as they stood on a truck and waved at the crowd during their roadshow to mark the beginning of Rahul Gandhi's Wayanad campaign. A marching band was part of the procession that took them to the government office. Heavy security was in place in and around the collectorate ahead of the high-profile visit of the Congress chief. Shortly after the roadshow, Congress general secretary Priyanka Gandhi Vadra tweeted an appeal to voters of Wayanad to "take care" of him. "My brother, my truest friend, and by far the most courageous man I know. Take care of him Wayanad, he won't let you down," she tweeted.